Big time athlete whose athleticism makes him an intriguing prospect. Very smooth approach to his game, looks like he’s never really trying. Point guard his entire life but grew in the last 12 months. Can play both guard spots and thrives in a transition, up tempo pace. Long, lengthy body can make him a two guard with no issue but scouts will love that in a one. Shot it very well at UCLA this past season. Quick first step allows him to explode in the lane. Finishes well around the rim with either hand. Nice pull up jump shot and can also catch and shoot with no issue. Quick enough to come into the NBA and guard points, big enough to guard two’s. Tons of upside for the former Bruin who is young for his class. Hard worker who has improved every off season after not being a huge recruit. Needs to gain muscle before he can step on an NBA floor. Seems content on the court too much, would like to see him become more aggressive. Doesn’t score as much as he should or take advantage of certain matchups. Jump shot form is all over the place. LaVine isn’t someone who is going to attack you one-on-one in a half court set and really break the defense down. Decision making is shaky at best. If he’s going to be a point, needs to run an offense better. Not a true leader on the court, seems quiet and not in charge. Doesn’t shoot well from the free throw line, can he keep up his shooting from deep? LaVine is basically a project at this point. Someone that will need to be in the gym all the time working on a lot of different things. Zach Lavine has the game that scouts drool over. Unlike other top prospects, Lavine is unable to showcase as much by sharing the floor with other NBA caliber teammates. Somewhat of a late bloomer, Lavine was raised as a PG who can score, he hit a growth spurt to ideal height and length of a SG (6ft5). Lavine has the handle of a PG and can take his man off the dribble or pull up from deep range. He can also look like a true SG who can run off screens and hit 3s from deep with a beautiful release. Zach plays above the rim, can slash when there is a crease in the defense or finish in transition. He plays with a quiet confidence. Zach is almost 19, and needs to add weight. He's not always showing great effort on defense or getting experience to carry his team in college. Also needs to work on his off hand. Zach has an All Star ceiling for sure, but going into the league he might struggle to develop if he is not a scoring option. There is a number of star players that he can compare to; Russell Westbrook, Monte Ellis, Jamal Crawford, even Steph Curry. Zach LaVine Full Highlights 2013.11.28 vs Nevada - 21 Pts. 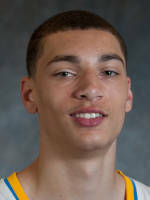 Zach LaVine UCLA commit 2012-2013 :"End of season highlights"